Conan the Adventurer... wow, I barely remember this series. I'm sure I must have watched it as I watched pretty much every cartoon that was on TV throughout the 80s and 90s. It's true, I did not stop watching once I entered high school, nor did I stop watching when I took on the challenge of college (though I did have to cut back quite a bit). Still, I only remember very small glimpses of this cartoon, such as that annoying Phoenix bird named Needle, and the evil serpent bad guy named Wrath-Amon (who reminds me of Serpentor from G.I.Joe). Being a children's cartoon show, this Conan couldn't have the edge that he otherwise had in the movies (and I assume the books, though I have yet to read any so can't say for sure). 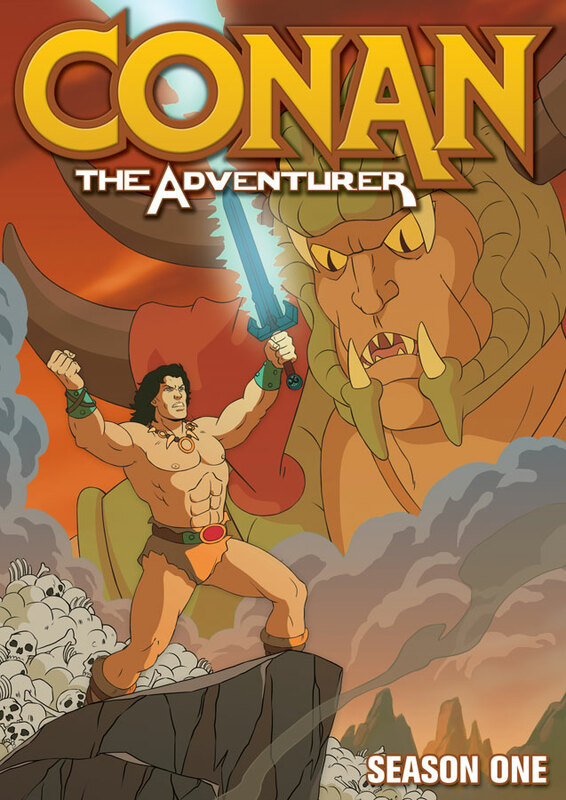 The villains in the show are serpent men who are disguised as human with magic, and instead of killing these reptilian foes Conan simply holds his sword toward them and they are sucked into some kind of energy void. This is said to be because his sword is made of star metal (metal that fell from space), and is an interesting way to get around the whole no killing thing. In the first episode, Conan is a young man, possibly a teenager, and when metal falls from the sky his father the blacksmith creates a bunch of weapons from it, including a sword for Conan to use when he's older. Years pass, and the main bad dude Wrath-Amon visits the village and demands all the star metal, but since it's gone he gets all pissed off and uses a spell to turn Conan's parents into stone. This gets Conan all pissed off and thus the two become sworn enemies! What I found unique about this show is that Conan sets off on an adventure to confront Wrath-Amon and in the second episode he finds Wrath-Amon and the two have it out. Normally I wouldn't expect this to happen until at least the end of the first season. Of course, neither one defeated the other, but he recognizes that the only way to defeat Wrath-Amon is to use star-metal weapons against him, and so the adventure goes on as Conan travels the land seeking out all the star-metal weapons his father crafted. In first half of the season it seems like he meets a new traveling companion almost every episode, and I also like that he didn't just start out with people he already knew. These are people from different backgrounds and cultures that he befriends, and each of them adds a unique skillset to the group. As a cartoon series, it's not bad. It can't compare to more modern cartoons such as Avatar: The Last Airbender, Oban Star Racers, or the just released Thundercats, but for its time it was actually a decent cartoon and it does have a pretty good entertainment value. I may have found myself rolling my eyes at times, but I never found myself bored or disappointed. The art and animation feels like a cartoon from the mid-to-late 80s to the early 90s, which is to be expected. The DVD set contains all 13 episodes of the first season on 2 discs, but unfortunately it doesn't contain any extra features. I would have liked to see a little behind the scenes about what it took to bring this character to a Saturday morning cartoon format. The second season had many more episodes, so it will most likely be released across several volumes. This set is a good value, coming in at approximately 5 hours running time for only twenty bucks.